These quality Wiha 'Pico Soft Grip' precision screwdrivers are useful for many tasks. 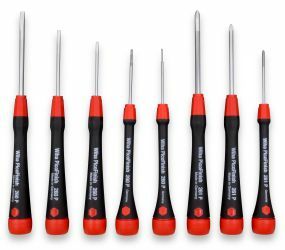 Manufactured by Wiha, a German tool making company, these screwdrivers feature a shaft and blade made from durable chrome-vanadium-molybdenum tool steel. The Easy Movement Rotating Cap fits comfortably against the palm and provides rapid hand action. This is a quality tool at an affordable price. The 2.5mm slotted head works well with all Winford breakout boards, while the #0 Phillips head works well with breakout boards which feature combination head screw terminals.